Photo: Sydney Cove - The Opera House, Royal Botanic Gardens, Circular Quay and The Rocks. In the Sydney City Center, the best places to see includes Sydney Cove, where you can find the Sydney Opera House, the Royal Botanical Gardens and The Rocks with its many attractions. Other places of interest are the many art galleries, museums and of course, great places to shop. Sydney Harbour contributes to the uniqueness of the city, you can explore it by ferry, harbour cruise and water taxi. There are wonderful walks that take you along the foreshore with magnificent views of the city and harbour, or explore our colonial and convict history. Sydney Harbour Bridge, joining the city with North Sydney has a museum and walks with magnificent views. You can access the bridge via Cambridge Street, there are special tours available that take you right to the top! See the Map Sydney. Circular Quay is the place that many visitors choose to start exploring the city, from here you can take also take ferries to Darling Harbour, Parramatta, Manly Beach and the Sydney Northern Beaches, Homebush Olympic Park and Taronga Zoo. Within walking distance of the Quay is the Sydney Opera House and just to the west, The Rocks, a restored historical district. Also within walking distance is the Museum of Sydney, with wonderful displays that allow closeup inspection of all kinds of artefacts relating to the city’s history, all the way back to the convict days. The Justice and Police Museum, on Phillip St. has a fascinating look at some of our history on the dark side. On the western edge of the Sydney CBD is the Sydney Wildlife World and Sydney Aquarium, both offering unique views of Australian marine and animal life. Located at Darling Harbour, you can also visit the Australian National Maritime Museum and the Powerhouse Museum. Both museums are great for families and kids of all ages. Darling Harbour also has plenty of opportunities for shopping for fashion, accessories and Australiana. See the Sydney City Map. The best places for Sydney shopping include Pitt Street, with its shopping centres and side street arcades. There is also Centrepoint, the MLC Centre, Australia Square and The Rocks. In the south part of the Sydney City Centre there is Chinatown for all things Asian, Market City for bargains of all kinds, while the Queen Victoria Building near the center of the city has plenty of upscale fashion to choose from. The Pitt Street Mall, and the streets leading up to it have many more shops to explore, from virtually all the world’s best name brands. Still within walking distance of Circular Quay, the east part of the Sydney CBD has the Art Gallery of NSW with excellent Australian and Aboriginal art collections while the Australian Museum explores our natural history and indigenous cultures. The Hyde Park Barracks Museum is a beautiful convict designed and built building which has artefacts, displays and exhibits relating to convict life. Often missed by visitors to Sydney is the State Library of NSW which houses an amazing collection of materials, art works, artefacts, photos, documents and writings relating to the history of Australia. They also have an everchanging series of exhibits and displays. See the Sydney Maps. 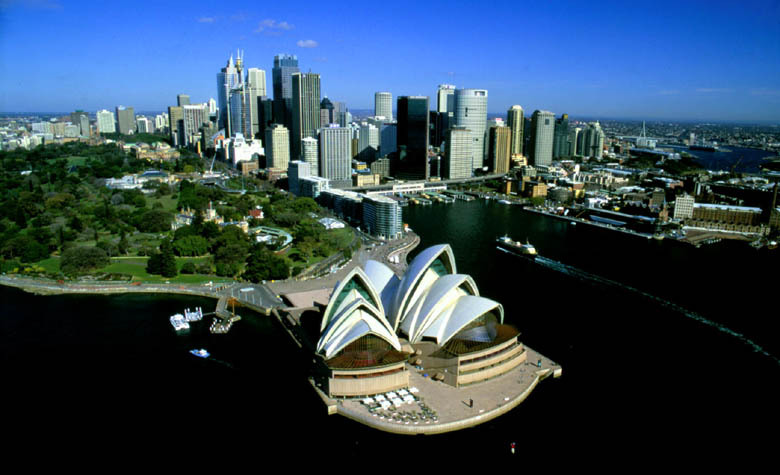 Main Photo: Sydney Cove - The Opera House, Royal Botanic Gardens, Circular Quay and The Rocks.